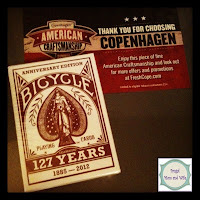 Frugal Mom and Wife: Free BBQ Sauce, Bicycle Playing Cards or Coupons From Copenhagen! Free BBQ Sauce, Bicycle Playing Cards or Coupons From Copenhagen! Free item you would like to have mailed! !